Morphological, biological, and genetic characteristics of a virulent Siphoviridae phage, named vB-EcoS-95, is reported. This phage was isolated from urban sewage. It was found to infect some Escherichia coli strains giving clear plaques. The genome of this phage is composed of 50,910 bp and contains 89 ORFs. Importantly, none of the predicted ORFs shows any similarity with known pathogenic factors that would prevent its use in medicine. Genome sequence analysis of vB-EcoS-95 revealed 74% similarity to genomic sequence of Shigella phage pSf-1. Compared to pSf-1, phage vb-EcoS-95 does not infect Shigella strains and has an efficient bacteriolytic activity against some E. coli strains. One-step growth analysis revealed that this phage has a very short latent period (4 min), and average burst size of 115 plaque forming units per cell, which points to its high infectivity of host cells and strong lytic activity. The bacteriolytic effect of vB-EcoS-95 was tested also on biofilm-producing strains. These results indicate that vB-EcoS-95 is a newly discovered E. coli phage that may be potentially used to control the formation of biofilms. Bacteriophages (or phages), i.e., viruses infecting bacterial cells, represent the most abundant biological creatures on Earth (Clokie et al., 2011). Number of phage virions is estimated at the level of 1031 (Weitz et al., 2012). These viruses have been discovered over 100 years ago (Twort, 1915; summarized by Wegrzyn and Wegrzyn, 2015). Some of them have played an extremely important role in development of molecular biology, serving as model organisms in studies on basic cellular processes, including gene expression, replication of genetic material, developmental regulation, environmental stress responses, and others (Wegrzyn and Wegrzyn, 2005; Krisch and Comeau, 2008; Casjens and Hendrix, 2015). Moreover, bacteriophages have been extensively used in genetic engineering and biotechnology, serving as cloning vectors and providing genetic elements used in construction of strictly regulated gene expression systems, phage display systems, and others (Onodera, 2010). The idea of the use of bacteriophages to combat bacterial infections appeared shortly after discovery of these viruses (for a review, see Wegrzyn and Wegrzyn, 2015). Early experimental phage therapy was promising, however, discovery of penicillin led to the believe that every bacterial infection can be eliminated by the use of antibiotics, and the idea of phage therapy has been largely abandoned (Kakasis and Panitsa, 2019). Recently, the return to the use of bacteriophages to combat bacterial infections is evident. In the era of the antibiotic crisis, phage therapy appears to be one of alternatives to treat infections with bacterial strains resistant to most, if not all, known antibiotics (Kutter et al., 2015; Domingo-Calap et al., 2016; Gorski et al., 2018a). Phage therapy is based on the simple expectation that viruses which can destroy bacterial cells can be an excellent tool to eliminate specific infection agents in human (or animal) body. The major advantage of this kind of therapy is its specificity [bacteriophages are usually specific to single bacterial species, and often to particular strain(s)], auto-control (phages should propagate only if their host bacteria are available), and safety (phages do not infect eukaryotic cells) (Górski et al., 2018b). However, some potential problems must also be considered, including possibility to lysogenize host cells by a phage instead of lysing it (thus, temperate phages should not be used in phage therapy), the presence of toxin genes in genomes of some bacteriophages (such phages must be avoided in phage therapy), and possibility of development of phage resistance by bacteria (Kakasis and Panitsa, 2019). Nevertheless, antibacterial activities of bacteriophages are so attractive that the use of these viruses has been extended to food protection (Gutiérrez et al., 2016), agriculture and industry (Domingo-Calap and Delgado-Martínez, 2018), i.e., in every area of human action where bacteria may cause unwanted effects. In the light of the extremely large population of bacteriophages (1031 virions on Earth, as mentioned above), a huge variability of these viruses (Hatful, 2015) is perhaps not a surprise. What is the surprise, is the relatively poor knowledge on this variability and relatively low number of characterized bacteriophages relative to other organisms (discussed by Jurczak-Kurek et al., 2016). Our previous studies indicated that even if bacteriophages are isolated from a single habitat, their diversity is huge (Jurczak-Kurek et al., 2016). Moreover, many phages isolated from environmental samples reveal properties that are very promising from the point of view of their applications in biotechnology or medicine (Jurczak-Kurek et al., 2016). In this report, we describe detailed characterization of bacteriophage vB-EcoS-95, isolated from urban sewage, including virion morphology, host range, developmental kinetics, and genome analysis. Specific features of this bacteriophage, infecting Escherichia coli strains, particularly an extremely short latent period and ability to destroy bacterial biofilm, suggest that it can be used in further studies on development of novel biotechnological tools and/or its use in food protection/medicine. Bacterial strains used in this study are listed in Table 1. E. coli strains and Pseudomonas bacteria were cultured in liquid Luria–Bertani broth (LB) or plated on solid LB medium with 1.5% agar (LA medium; Lab Empire). For Enterococcus and Shigella, special Tryptic Soy Broth (TSB) and Tryptic Soy Agar (TSA) were used (BTL). The liquid cultures were grown with aeration at 37°C in a shaking incubator (200 rpm; Eppendorf). The plates with solid medium were incubated at 37°C for 24 h. The phage infection processes were studied at 37°C, under aerobic conditions in a shaking incubator (200 rpm; Eppendorf). Biofilm studies were performed by using E. coli MG1655 strain bearing pUC18 plasmid and F′ plasmid from E. coli ER2738 strain. These bacteria were grown at 37°C without shaking in 12-well polystyrene plate with M9 medium containing 0.2% glucose (POCH). Table 1. Bacterial strains and plasmid used in the study. Bacteriophage vB_EcoS-95 was isolated from urban sewages, according to protocols described by Jurczak-Kurek et al. (2016). Water samples were collected from Gdansk Wastewater Treatment Plant in Poland. In the first stage of the procedure, 10 ml of the sewage sample were mixed with 1 ml of the E. coli MG1655 overnight culture and cultivated for a few hours at 37°C with shaking. The obtained phage lysate was clarified by centrifugation (10,000 × g, 30 min, 4°C) and extracted several times with chloroform (POCH). To obtain visible plaques, formed by phages, 50 μl of the supernatant were added to 2 ml of the overnight host bacterial culture and plated using the agar double layer method (Sambrook and Russell, 2001). Next day, a single plaque was scraped with a sterile bacteriological loop and transferred to a flask with mid-log phase E. coli MG1655 strain. After the lysis of bacterial culture occurred, chloroform extraction was carried out and phages were re-plated on a lawn of E. coli MG1655 strain. Serial dilutions of the phage lysate in TM buffer (10 mM Tris-HCl, 10 mM MgSO4; pH 7.2) were prepared. Then, appropriate volume of each dilution was spotted onto double agar layer to obtain single phage plaques that were propagated three times by this method to obtain purified vB_EcoS-95 lysate. For further analysis, the required amount of vB_EcoS-95 lysate was prepared by adding phage particles to the exponentially growing E. coli MG1655 bacteria which were then cultivated with shaking at 37°C (200 rpm; Eppendorf) until lysis occurred. In the next step, phage particles, released during lysis, were purified by centrifugation and extracted with chloroform. Phage activity was determined using a conventional double-layer agar technique (Sambrook and Russell, 2001). The phage host range spectrum was determined using different bacterial strains which are listed in Table 2. The spot lysis assay was prepared onto a double layer agar plate, following the protocol described by Jurczak-Kurek et al. (2016). Briefly, standard Petri dishes were filled with 25 ml of LA (E. coli and Pseudomonas strains) or TSA (Enterococcus and Shigella strains) medium. Then, 3 ml of LB (E. coli and Pseudomonas strains) or TSB (Enterococcus and Shigella strains) medium, supplemented with 0.7% agar/0.4% agarose, were mixed with 1 ml of the overnight bacterial culture and poured onto LA or TSA bottom agar, respectively. Ten-fold dilutions of vB_EcoS-95 lysate were prepared in TM buffer (10 mM Tris-HCl, 10 mM MgSO4; pH 7.2) and spotted onto the surface of the double-layer agar plates with a tested host. Plates were incubated at 37°C for 24 h. Productive interaction of the bacteriophage with the host bacterium was revealed as the presence of plaque formation. According to the degree of clarity, the observed results were differentiated into three classes: (++) clear plaques, (+) turbid plaques, and (−) no plaques. Table 2. Host spectrum of bacteriophage vB_EcoS-95. Virions were purified from the phage lysate (2.1 × 1010 PFU/ml) obtained after infection of the host strain E. coli C600 with phage vB_EcoS-95. Purification was performed using cesium chloride density gradient centrifugation method, described by Sambrook and Russell (2001). Electron microscopic analyses of phage particles were performed employing the Philips CM 100 electron microscope (Philips, Eindhoven, The Netherlands), by using negative staining with uranyl acetate (Czajkowski et al., 2015). Dimensions of virions were measured on micrographs at magnification of 39,000 times, with analySIS Pro (iTEM) software. The Tomocube holographic 3D microscope (Perlan Technologies, Poland) was used to evaluate the structure of E. coli biofilms after 4 h incubation with phage vB_EcoS-95 lysate (2.1 × 1010 PFU/ml). Plaque morphology of phage vB_EcoS-95 was tested on the E. coli C600 strain. To determine plaque size, serial dilutions of phage lysate in TM Buffer (10 mM Tris-HCl, 10 mM MgSO4) were prepared. Next, 1 ml of the host strain culture was mixed with 10 μl of each dilution of phage lysate and added to 3 ml of top LB with 0.7% agar. The mixture was spread onto LA plate. Diameters of plaques were measured manually and pictures were taken using the digital scanner HP Scanjet G4050 and assigned software. Phage stability tests were performed according to protocols described by Jurczak-Kurek et al. (2016). To determine the sensitivity of phage lysate, the following external factors were tested: temperature (−20, 20, 30, 37, 40, 62, and 95°C), pH (2, 4, 10, and 12), organic solvents (ethanol, chloroform, DMSO, and acetone), and detergents (SDS, sarkosyl, and CTAB). The survival of phages during osmotic shock conditions was also analyzed. Bacteria were grown in LB medium at 37°C to OD600 = 0.3. Samples of 6 ml were centrifuged and pellets were washed with 1 ml of 0.85% NaCl (Chempur). After centrifugation, each pellet was suspended in 1.3 ml of LB medium and incubated at 37°C for 15 min. Then, bacteriophage lysate was added to m.o.i. = 0.1. During the incubation, samples were withdrawn at indicated times and centrifuged (6000 × g for 1 min at room temperature). In the next step, the supernatants were titrated. Plates were incubated at 37 °C overnight. A sample withdrawn immediately after addition of phage lysate to the bacterial host strain (time zero) was considered as 100% non-adsorbed phages. Other values were calculated relative to this value. Intracellular lytic development of phage vB_EcoS-95 was studied in one-step growth experiment, according to the procedure described by Bloch et al. (2013), with minor modifications. 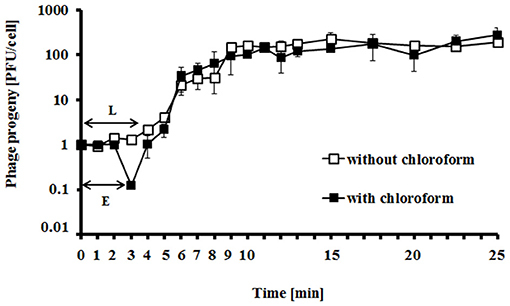 Briefly, E. coli MG1655 host cells were grown with shaking in LB medium at 37°C to OD600 = 0.2. Then, 10 ml of culture sample were harvested by centrifugation (4,000 × g, 10 min, 4°C). The supernatant was discarded, and the pellet was resuspended in 1 ml of fresh LB medium with 3 mM sodium azide (Sigma-Aldrich). Following 5-min incubation at 37°C, bacteriophage vB_EcoS-95 was added to E. coli MG1655 to m.o.i. = 0.01. After 10 min incubation at 37°C, non-adsorbed phage particles were removed by three times washing with 1 ml of LB medium containing 3 mM sodium azide (4,000 × g, 10 min, 4°C). In the next step, 25 μl of the suspension was added to 25 ml of LB medium (time 0), and aerated in an incubator shaker at 37°C. The number of phage-infected bacterial cells was determined at time 1 min after infection by mixing 5 μl of the culture sample with 0.995 ml of an overnight E. coli MG1655 culture and 2 ml of top agar (LB with 0.7% agar), prewarmed to 45°C. Next, the mixture was poured onto LA plate (infected bacteria were named “infection centers” because they were sources of new phage particles, which were released from host cells during one lytic cycle, and following infection of neighboring cells could form plaques). Two sets of samples were collected every 1 min during first 10 min, and then every 2.5 min. The samples were serially diluted (10-fold each) in TM buffer (10 mM Tris-HCl, 10 mM MgSO4) and titrated under permissive conditions. Before the titration, the second set of samples was treated with 1% chloroform (final concentration) to release the intracellular phage particles to determine the eclipse period. Based on the number of PFU/ml, the latent period and burst size were determined (the burst size was estimated as the ratio of the phage titer to the titer of infection centers). Host culture was grown to OD600 = 0.2 at 37°C. Phage lysate was add to m.o.i. = 0.05 to the flask. Bacteria were incubated with shaking at 37°C, and their density was monitored by OD600 measurement in the same time intervals (every 5 min). During this experiment, survival of host bacteria after phage infection (CFU/ml) and phage titer (PFU/ml) were also analyzed. 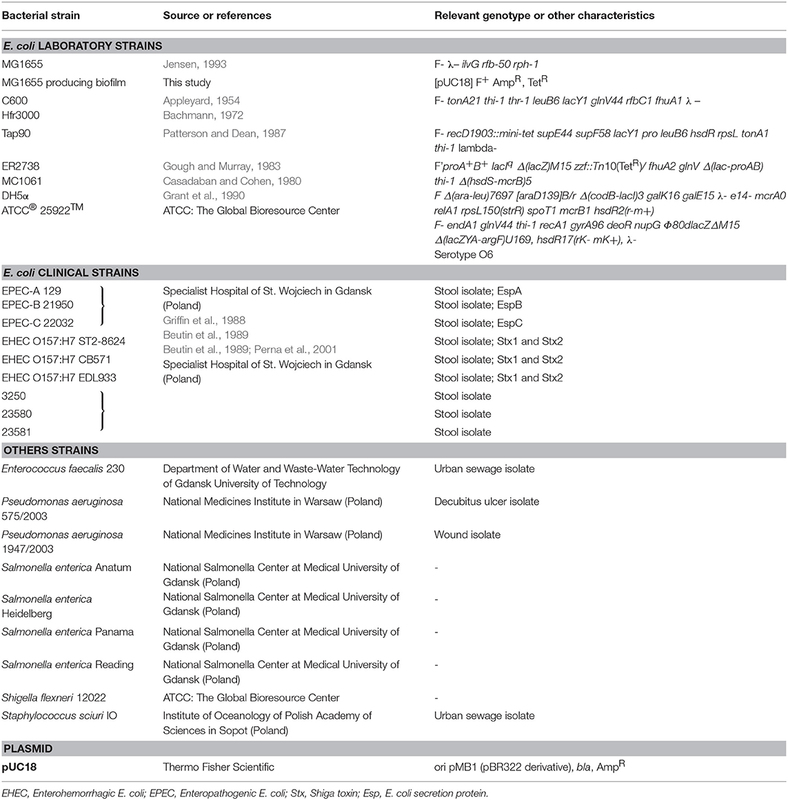 To estimate the number of surviving cells after the vB_EcoS-95 infection, 100 μl samples were collected at times indicated above, and their serial 10-fold dilutions were prepared in LB. Forty μl of each dilution were spread onto LB agar plates. The number of viable bacterial cells was calculated on the basis of counted colonies. To determine the number of phages per ml, samples were taken every 5 min and their serial 10-fold dilutions were prepared in TM buffer. Next, 2.5 μl of each dilution were spotted onto double agar layer, and then plates were incubated overnight at 37°C. The phage titer was calculated on the basis of counted plaques. The emergence of bacterial resistance was measured for the combination of phage vB_EcoS-95/antibiotic rifampicin (Lab Empire) and the E. coli MG1655 strain. Host bacteria were cultured to OD600 = 0.2 at 37°C. Next, the culture was divided into three aliquots. Phage lysate was added to one of the flasks to m.o.i. of 0.01. The second one was treated with rifampicin to a final concentration of 25 μg/ml. The last one was a control. The cultivation was continued at 37°C. After 3 h of shaking, 10 μl of each samples were withdrawn. Serial dilutions in LB medium were prepared and 90 μl of each dilution was spread on LB agar plates. After overnight incubation at 37°C, percentage of surviving E. coli bacteria after phage infection or rifampicin treatment was calculated relative to bacterial control. To estimate the percent of bacterial colonies resistant to phage vB_EcoS-95 infection, 300 colonies were passaged in each well of a 24-well plate with 2 ml of LB medium and shaken at 37°C to OD600 = 0.1. Next, the phage lysate was added to each well to m.o.i. of 1. The lack of bacterial cell lysis indicated the emergence of bacterial resistance to phage vB_EcoS-95 infection. To calculate the percent of bacteria resistant to tested antibiotic, the same number of bacterial colonies was passaged onto LB agar plates supplemented with rifampicin to final concentration of 25 μg/ml, and incubated for 24 h at 37°C. Biofilm cell density after phage infection was determined according to the protocols described by Sung et al. (2006) and Vianney et al. (2005), with some modifications. For biofilm cell culture, E. coli MG1655/pUC18 F′ strain was grown at 37°C in 12-well polystyrene plate with M9 medium containing 0.2% glucose. After 48 h of growth, the liquid medium containing planktonic cells was removed. The surface-attached cells in the biofilm were washed with 1 ml of 1 × PBS. In the next step, phage lysate was added to each well, except for controls, to the final titer of 102, 104, 105, 107 or 1010 PFU/well, and then plates were incubated at 37°C for 4 h. In the case of control wells, the medium was added instead of phage lysate. Fallowing the incubation, phage lysate was removed and surface-attached cells were resuspended in 1 ml of 1 × PBS. The biomasses of bacterial biofilm were estimated by measuring the optical density (OD) with a plate reader (EnSpire Multimode Plate Reader) at wavelength 600 nm. In order to take photos of biofilms for densitometry analyses, phage lysate was removed and surface-attached cells were dried at 37°C for 15 min. Biofilm area intensities were quantified from the performed images by densitometry, using QuantityOne software (Bio Rad®). Biofilm cells were prepared according to the procedure described above. After the incubation with phage lysate (added to final titer of 102,104,105,107, or 1010 PFU/well), the liquid medium containing planktonic bacteria was carefully removed and surface-attached cells were treated with 0.5 ml of 0.1% crystal violet (Sigma-Aldrich). Plates were incubated in the dark for 30 min at room temperature. In the next step, crystal violet was carefully removed and biofilms were washed 5 times with 1 ml of 1 × PBS. Then, biofilms were fixed by incubating the plates at 60°C for 30 min. Following the incubation, crystal violet was dissolved by the addition of 1 ml of 96% ethanol. To determine the biomass of bacterial biofilm, absorbance was measured in a plate reader at 570 nm (EnSpire Multimode Plate Reader). Biofilm area after fixation was also photographed to visualize the differences in biofilm biomass after phage lysate treatment. Biofilms were prepared in the same way as described above. Briefly, after incubation with phage lysate (added to final titer of 102,104,105,107,1010 PFU/well), the liquid medium was removed. The biofilms were suspended in 1 ml of 1 × PBS. In the next step, resazurin was diluted in PBS buffer and added to each well to a final concentration of 6 μg/ml. Plates were gently shaken and incubated for 150 min at room temperature. The fluorescence of the produced resorufin (λexc = 570 and λem = 590 nm) was measured every 15 min in a plate reader (EnSpire Multimode Plate Reader). Results are presented in Fluorescent Units (FU). The phage lysate was treated with DNase I (1 U/μl; Thermo Fisher Scientific) and RNase A (5 ug/μl; Thermo Fisher Scientific) to degrade bacterial nucleic acids. To digest the exogenous DNA and RNA, the mixture was incubated for 30 min at 37°C. Then, DNase I and RNase A were inactivated by heating to 95°C and the genomic DNA of phage vB_EcoS-95 was isolated with a MasterPure™ Complete DNA and RNA Purification Kit (Epicenter). The DNA concentration was determined spectrophotometrically at 260 nm. Phage genomes were sequenced in the Genomed company involving Next Generation Sequencing (NGS) and MiSeq (Illumina) genome sequencer. Assembly of the sequences was accomplished by the experts from the Genomed bioinformatics group. The quality of vB_EcoS-95 reads was controlled using FastQC (https://www.bioinformatics.babraham.ac.uk/projects/fastqc/), with following parameters: -q = 20 and -m = 36. The raw data (792,164 raw reads) were filtered using a Cutadapt program (http://code.google.com/p/cutadapt/) to remove the adapters, N bases, and low-quality reads. De novo assembly (99.97% of raw reads) was conducted using CLC Genomics Workbench. Finally, the assembly generated a single contig, corresponding to the entire phage vB-EcoS-95 genome with an average coverage of 2,629 x. Additionally, the obtained sequencing results, were analyzed for any errors in contigs assembly using following programs: BLAST (http://blast.ncbi.nlm.nih.gov/Blast.cgi), Progressive MAUVE (http://darlinglab.org/mauve/mauve.html) and Serial Cloner software (http://serialbasics.free.fr/Serial_Cloner.html). The fully assembled genome of phage vB_EcoS-9 was annotated using myRAST software (Caldeira and Peabody, 2007) and UGENE bioinformatics software (http://ugene.net/) (Essoh et al., 2015). The identification of the putative protein-coding genes was based on the presence of a plausible ribosome binding site, and both the start and stop codons. Furthermore, genome annotation was verified and curated by BLAST analysis, HMMER software (http://www.hmmer.org/), Phobious webserver (http://phobius.binf.ku.dk/) and TMHMM program (http://www.cbs.dtu.dk/services/TMHMM/). Circular map of vB_EcoS-95 phage genome was generated using BLAST Ring Image Generator (BRIG) platform (https://sourceforge.net/projects/brig/) and CGView was used to perform GC skew and GC content analyses (Stothard and Wishart, 2005). A linear visualization of alignments of vB_EcoS-95 and pSf-1 (accession number KC710998) genomes was generated by Easyfig program (http://mjsull.github.io/Easyfig/files.html). The Neural Network Promoter Prediction NNPP method (http://www.fruitfly.org/seq_tools/promoter.html) was used to find phage-specific promoters in a DNA sequence. The positions of Rho-independent transcriptional terminators were determined using FindTerm tool (http://www.softberry.com/berry.phtml). Finally the genome sequence of the E. coli phage vB_EcoS-95 with annotations was deposited in the GenBank database under the accession number MF564201. Based on the predicted amino acid sequences, obtained from the genome analysis, phylogenetic analysis for the phage was made. To construct the phylogenetic tree, the sequence for the terminase large subunit (TerL), which is universally used genetic marker for the order Caudovirales, was selected. The terminase sequence of the vB_EcoS-95 phage was aligned with those of other reference bacteriophages within the order Caudovirales, which were collected from the NCBI database, using MUSCLE implanted in the MEGA (http://www.megasoftware.net/). A neighbor-joining phylogenetic tree for terminase large subunit amino acid sequences was constructed using the Poisson model. The robustness of the tree topology was assessed by bootstrap analyses based on 1,000 random resamplings. All protein analyses were carried out at the Institute of Bioorganic Chemistry of Polish Academy of Sciences. In the first step, the phage suspension in TM buffer (10 mM Tris-HCl, 10 mM MgSO4) was treated with 4 volumes of ice-cold acetone and incubated at −20°C for 30 min. Then, the sample was centrifuged (13,000 × g, 5 min, 4°C) and the supernatant was discarded. The pellet was dried in laminar flow hood at room temperature. Then, the pellet was reconstituted in 50 mM ammonium bicarbonate in the initial sample volume. The total concentration of phage proteins was measured by using BCA colorimetric assay (Thermo Fisher Scientific). An aliquot of phage proteins was treated with 5.6 mM dithiothreitol (DTT) in 50 mM ammonium bicarbonate prior to heating at 95°C for 5 min. The sample was allowed to cool to room temperature and then was alkylated with 5 mM iodoacetamide. The mixture was incubated in the dark, at room temperature for 20 min. In the next step, phage proteins were digested with 0.2 μg of sequencing-grade trypsin (Promega). After overnight incubation at 37°C, the trypsin activity was suppressed by adding trifluoroacetic acid (TFA) to a final concentration of 0.1%. Then, the mixture was transferred to HPLC conical vial. The analysis of phage proteins was performed by using Dionex UltiMate 3000 RSLC nanoLC System connected to QExactive Orbitrap mass spectrometer (Thermo Fisher Scientific). Peptides derived from in-solution digestion were separated on a reverse phase Acclaim PepMap RSLC nanoViper C18 column (75 μm × 25 cm, 2 μm granulation) by using acetonitrile gradient (from 4 to 60%, in 0.1% formic acid) at 30°C and a flow rate of 300 nL/min (for 185 min). Mass spectra were acquired on the Q Exactive in a data-dependent mode by using top 10 data-dependent MS/MS scans. Target value for the full scan MS spectra was set to 1e6 with a maximum injection time of 100 ms and a resolution of 70,000 at m/z 400. The 10 most intense ions charged two or more were selected with an isolation window of 2 Da and fragmented by higher energy collisional dissociation with NCE 27. The ion target value for MS/MS was set to 5e4 with a maximum injection time of 100 ms and a resolution of 17.500 at m/z 400. Identification of proteins was performed by using database created from translated open reading frames that have been found in the genome of phage vB_EcoS-9 (the precision of tolerance for peptide and fragment of ion masses was 10 ppm and 0.8 DA, respectively). All raw data obtained for each dataset were imported into Proteome Discoverer 1.4 software (Thermo Scientific). Protein was considered as positively identified if at least two peptide spectral matches per protein were found by Sequest search engine, and a peptide score reached the significance threshold FDR = 0.05. Statistical significances were determined using t-test. The significance of differences between compared experimental variants were marked by asterisks P < 0.05 (*), P < 0.01 (**) or P < 0.001 (***). The vB-EcoS-95 bacteriophage was isolated as a virus infecting E. coli from samples of urban sewage. The isolation procedure was based on the one-host enrichment method in which a raw urban sewage sample was mixed with a culture of E. coli MG1655 strain to obtain the lysate of vB-EcoS-95 bacteriophage, as described in the Material and Methods section. We found that this bacteriophage is able to efficiently infect different E. coli strains, including those lysogenic with various lambdoid phages. However, Shiga toxin-producing E. coli serotype O157:H7 was resistant to vB-EcoS-95 (Table 2). 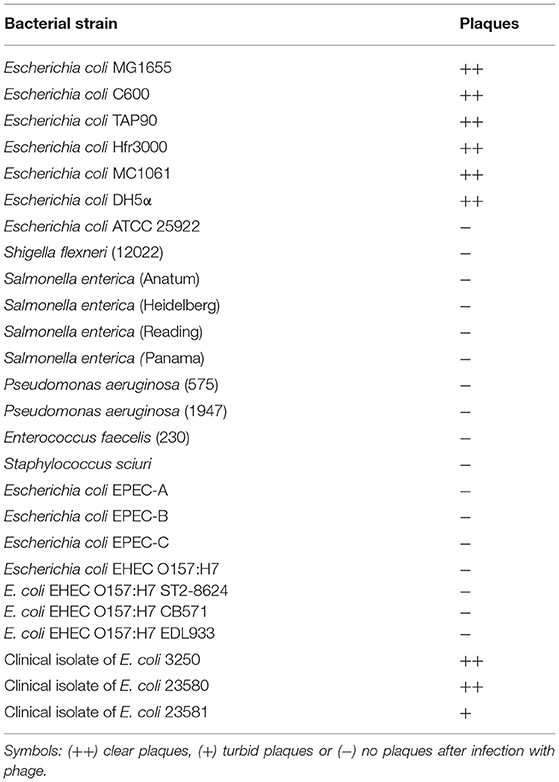 Moreover, vB-EcoS-95 is not able to infect other bacterial species, including other species from Enterobacteriaceae, like Shigella flexneri or Salmonella enterica (Table 2). Bacteriophage vB-EcoS-95 forms clear plaques (diameter 2.5 ± 0.5 mm), with a halo, on E. coli lawn (Figure 1). Electron microscopic studies indicated that the virion of this phage consists of a head (diameter 53 nm), flexible, non-contractile tail (127 nm length, 10 nm width), and 3 tail fibers (about 39 nm length, 2.5 nm width). Therefore, taking into account the morphological characteristics of phage vB-EcoS-95, we conclude that this bacterial virus belongs to the Siphoviridae family (Table 3). Figure 1. Electron micrograph of phage vB_EcoS-95 (A) and its plaques formed in double-layer agar plates with E. coli MG1655 strain (B). The bar corresponds to 50 nm. Table 3. Morphological characteristic of bacteriophage vB_EcoS-95. We have tested sensitivity of vB-EcoS-95 virions to physical and chemical factors. The results, presented in Table 4, indicate that this phage is particularly sensitive to high temperature, low pH, the presence of SDS (ionic detergent) and organic solvents, like ethanol and acetone. It is, however, resistant to freezing, osmotic shock, and chloroform (Table 4). Table 4. Resistance of phage virion to physical and chemical agents. We have determined that bacteriophage vB-EcoS-95 adsorbs rapidly on E. coli cells, with 50% phages already adsorbed within 2 min after mixing phage lysate with bacterial culture (Figure 2). Figure 2. Kinetics of vB_EcoS-95 phage adsorption on host cells. Results are presented as mean values ± SD from three independent experiments. Intracellular phage development appeared extremely rapid, with the eclipse and latent periods 3 min and 4 min, respectively (Figure 3). The average bust size in E. coli grown at 37°C in LB medium has been estimated to be 115 PFU (plaque forming units) per cell, indicating efficient lytic development of the phage (Figure 3). Figure 3. Kinetics of progeny production by vB_EcoS-95 phage in the single life cycle. Closed squares, chloroform-treated sample; open squares, non-chloroform-treated sample. E, eclipse period; L, latent period. Results are presented as mean values ± SD from three independent experiments, and shown as PFU (plaque-forming units) per 1 cell. We have analyzed the lysis profile of phage vB-EcoS-95, taking account the bacterial density after addition of phage particles, the number of surviving host bacteria after phage infection, and the increase of the phage titer during this process (Figure 4). We observed that the lysis of host culture was very rapid and complete within 20–25 min. Interestingly, the emergence of resistance of E. coli bacteria against phage vB-EcoS-95 was similar to that against antibiotic rifampicin (Table 5). However, the percentage of surviving host cells after phage infection was considerably lower than that observed in antibiotic-treated bacteria (Table 5). Figure 4. Kinetics of lytic development of bacteriophage vB_EcoS-95 in E. coli MG1655 bacteria. Results are shown as (A) bacterial culture density measured at OD600, (B) a number of surviving cells after the vB_EcoS-95 infection per 1 ml (CFU/ml), and (C) a number of phages per 1 ml (PFU/ml). Results are presented as mean values ± SD from three independent experiments. Please note that in some cases, the bars are smaller than sizes of symbols. Table 5. Appearance of E. coli MG1655 resistance to phage vB_EcoS-95 and to rifampicin. We asked whether vB-EcoS-95 is able to destroy biofilms formed by E. coli cells. Thus, we have tested biofilm density (by measuring the optical density at λ600 nm of the resuspended biofilm), biofilm biomass (using the crystal violet assay), and metabolic activity of cells in the biofilm (using the resazurin assay) after administration of different numbers of vB-EcoS-95 virions. In all these tests, we have observed deleterious effects of the tested bacteriophage on bacterial biofilm: its density (Figure 5), biomass (Figure 6), and metabolic activity (Figure 7). In all tests, the effects of the bacteriophage on the biofilm depended on number of virions used in the experiments, with the most pronounced effects at the highest number of administered virions. We are aware that the results obtained in various kinds of experiments differ in details. This is perhaps due to various sensitivities of different methods. Nevertheless, the general trend of the effects of phage vB-EcoS-95 on the bacterial biofilm is the same in all performed tests. Figure 5. Biofilm density after a 4-h incubation with vB_EcoS-95 phage added to final titer of 102,104,105,107, or 1010 PFU/well. Results were (A) estimated by measuring the optical density at wave length 600 nm of the resuspended biofilms or (B) quantified densitometrically using Quantity One program from bacterial biofilms pictures (C). Results are presented as mean values ± SD from three independent experiments. Statistical analyses were performed by t-test. The significance of differences between control (no infection) and particular variants of phage infection are observed and marked by asterisks P < 0.01 (**) or P < 0.001 (***). Figure 6. Biofilm biomass after infection with phage vB_EcoS-95, estimated by crystal violet staining method and (A) presented as optical density values measured at wave length 570 nm or (B) photographed. Phage was added to final titer of 102,104,105,107, or 1010 PFU/well and incubated with bacteria in biofilm for 4 h. Error bars indicate standard deviations of triplicate experiments. Statistical analysis (t-test) was performed between control and analyzed variants of phage infection. Statistical differences are marked by asterisks P < 0.05 (*) or P < 0.001 (***). Figure 7. Metabolic activity / viability of cells in the biofilm, incubated for 4 h with different numbers of vB_EcoS-95 virions (102,104,105,107, or 1010 PFU/well), determined by resazurin assay in which the non-fluorescent blue resazurin is converted to the fluorescent pink resorufin. Bacterial cells viability is presented as fluorescence emitted by resorufin (A) and pink color of the bacterial culture in the wells (B). Results are presented as mean values ± SD from three independent experiments. Please note that in some cases, the bars are smaller than sizes of symbols. The effects of vB-EcoS-95 on the biofilm destruction have been confirmed in experiments with holographic 3D microscopy. Significant lowering of the biofilm density could be observed after addition of phage vB-EcoS-95 lysate to E. coli-formed biofilm (Figure 8). Figure 8. Images of bacterial biofilms untreated and treated for 4 h with vB_EcoS-95 phage lysate added to a final titer of 1010, performed by holographic 3D microscopy (A,B) and densitometry analysis of the obtained microscopic data (C). Statistical analyses were performed by t-test. The significance of differences between compared experimental variants were marked by asterisks P < 0.001 (***). The whole genome of vB-EcoS-95 has been sequenced. It consists of 50,910 bp and is deposited in GenBank (accession number: MF564201). The map of this genome is presented in Figure 9. Analysis of the vB-EcoS-95 genome indicated that it is a double-stranded DNA, with a 45% total G+C content. This analysis has shown 45 putative promoters, 30 putative transcription terminators and 89 open reading frames (ORFs). Among all identified coding regions, only 24 ORFs were predicted to be functional genes. 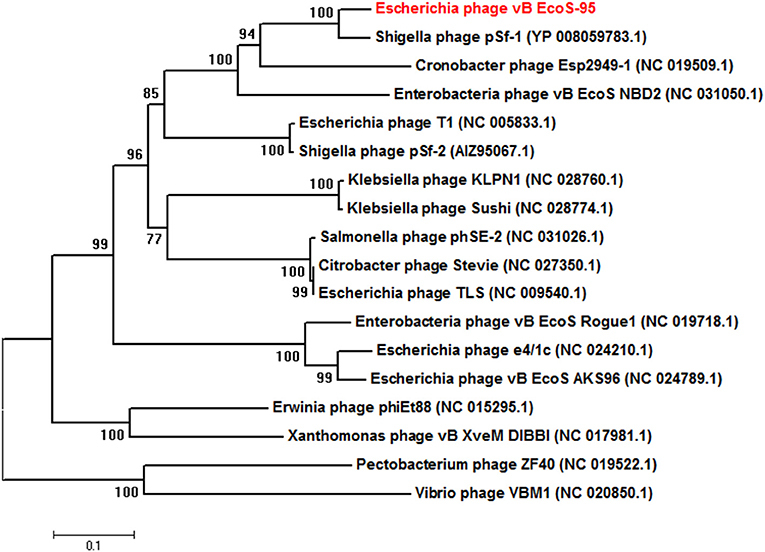 As showed in Figure 10, the large terminase subunit of vB-EcoS-95 bacteriophage presents the highest identity with large terminase subunit of other virulent Siphoviridae phage, pSf-1, that infects Shigella flexneri (Jun et al., 2013). Sequence similarity searches revealed that vB-EcoS-95 presents ~74% nucleotide sequence identity with phage pSf-1. Besides, these two phages are highly similar in gene inventory. As indicated in Figure 11, both phage genomes contain blocks of genes in which genes are clustered by function and encode products that operate in similar way, such as proteins responsible for DNA replication, modification, recombination etc. Interestingly, in both cases, genes coding for products participating in DNA packaging and morphogenesis are located at the middle and the end of the genome. Figure 9. 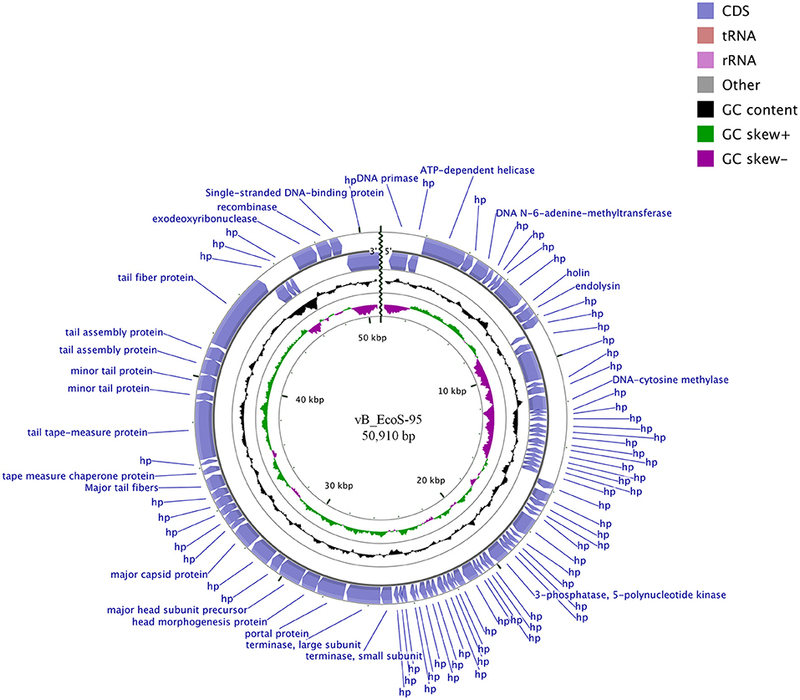 BRIG- and CGView-derived schematic map of circular genome of the vB_EcoS-95 phage. The inner rings show genome location, GC skew + (green) and—(purple) and GC content (black). Two the most external rings show identified open reading frames (blue arrows) and results of genome annotation process. Figure 10. Neighbor-joining phylogenetic tree of the terminase large subunit (TerL) amino acid sequences showing the phylogenetic position of phage vB_EcoS-95 (in red color). The reference sequences were collected from the NCBI database. The tree was constructed using MEGA 7 after performing a sequence alignment using MUSCLE. Bootstrap values, calculated based on 1,000 resamplings, are shown at the nodes. Figure 11. Easyfig output image of the genomic comparison between phage vB_EcoS-95 and the most related phage pSf-1. Phage genomes are presented by linear visualization with coding regions shown as arrows. Selected open reading frames are colored in relation to their functions. The percentage of sequence similarity is indicated by the intensity of the gray color. Vertical blocks between analyzed sequences indicate regions with at least 73% of similarity. 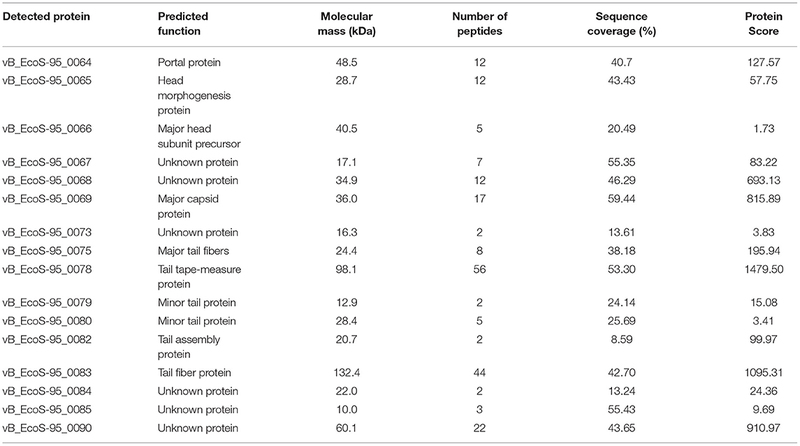 The proteins of phage vB-EcoS-95 detected by MS are listed in Table 6 with their observed molecular mass, the number of identified peptides in each protein and the corresponding protein sequence coverage. For all proteins, the identification was based on fragmentation patterns of unique peptides. The data analysis allowed us to assign 16 vB-EcoS-95 phage proteins to annotated open reading frames (ORFs). In this manner, protein annotation of 10 in silico-predicted structural proteins was confirmed. In addition, 6 gene products having little or no similarity to known phage proteins could be classified as proteins of unknown function. The identification analyses of the proteins can be verified in the Supplementary Tables of data available with the online version of this paper (Supplementary Material – MS identification data). Table 6. Mass spectrometry analysis of bacteriophage vB_EcoS-95 virion. A newly isolated bacteriophage, vB-EcoS-95, infecting E. coli strains, has been characterized. It infects various E. coli strains, including those lysogenized with different lambdoid phages and clinical isolates, however, E. coli O157:H7 bacteria are resistant to this phage. The most intriguing property of this phage is its extremely rapid development in E. coli cells. Under standard laboratory conditions, i.e., growth of host bacteria at 37°C in LB medium, the latent period was as short as 4 min, and the lysis of host culture was complete within 20-25 min. This was accompanied with relative high average burst size of 115 pfu/cell. For comparison, one-step growth experiment of phage pSf-1 (the most closely related phage to vB-EcoS-95, reported to date; however, note that the level of similarity of pSf-1 and vB-EcoS-95 genomes, 74%, is still moderate) and other closely related phage pSf-2 showed that the latent period was longer (10 and 30 min, respectively) and burst size was lower (around 87 and 16 PFU/cell, respectively) (Jun et al., 2013, 2016). Another interesting feature of this phage is its ability to destroy bacterial biofilm which was demonstrated by using various methods, including crystal violet and resazurin assays, as well as holographic 3D microscopy. Genome of vB-EcoS-95 revealed 74% similarity to previously described phage pSf-1, infecting Shigella flexneri (Jun et al., 2013). However, unlike that phage, vB-EcoS-95 does not infect S. flexneri. In fact, only some E. coli strains could be effectively infected by the newly isolated phage. Moreover, contrary to pSf-1, phage vB-EcoS-95 reveals an extremely short latent period (about 4 min) after infection of the E. coli host (see above). It is unclear what causes such a rapid lytic development of vB-EcoS-95. Genome analysis indicated that this phage does not encode its own DNA polymerase, therefore, it is unlikely that extremely quick phage DNA synthesis is responsible for this phenomenon, though one cannot exclude that initiation of this process is particularly efficient. On the other hand, it appears that vB-EcoS-95 encodes an untypical lytic protein (Supplementary Material—genome annotation) which might potentially contribute to rapid lysis of the host cell. All the properties of vB-EcoS-95 make it a potentially attractive phage in further studies on its use in biotechnological applications and/or as a factor for food protection or therapeutic agent (in phage therapy). Particularly, very rapid lytic development, accompanied with a relatively high burst size indicate that this phage can destroy host cells very rapidly, which is beneficial in both phage therapy and protection of food or various materials against bacterial colonization. Effective destruction of bacterial biofilm may be of particular importance, as formation of such a structure by bacteria protects them against various antibacterial agents, including antibiotics. On the other hand, vB-EcoS-95 effectively infects only some E. coli strains, including some clinical isolates, but excluding E. coli O157:H7. This might be a potential limitation in the medical use of vB-EcoS-95, though one must note that specificity of phages to certain strains is a commonly occurring feature of these viruses. 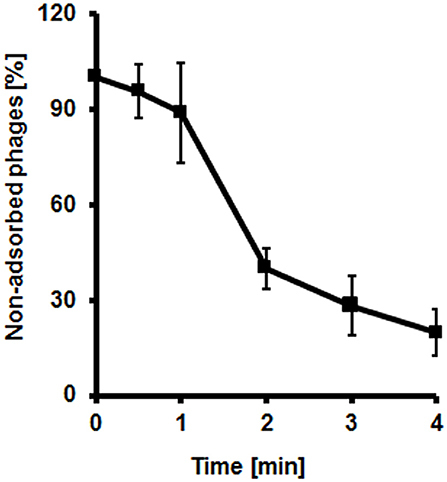 The vB-EcoS-95 phage survives well at relatively low temperatures, but <50% virions could retain infectivity at 40°C. This might suggest a potential limitation in phage therapy, as bacterial infections usually cause fever in patients. On the other hand, in phage therapy procedures, a large excess of bacteriophages is usually applied, therefore, such a survival rate should not significantly influence efficacy of the therapy. Finally, although appearance of bacteria resistant to vB-EcoS-95 was as frequent as appearance of bacteria resistant to antibiotic, survival of E. coli cells after administration of the phage was significantly lower than that after administration of rifampicin. This suggest an advantage of the use of vB-EcoS-95 in phage therapy or protection of food or various materials. In summary, the newly isolated vB-EcoS-95 phage, infecting E. coli cells, reveals various specific features, particularly, rapid development and cell lysis, ability to destroy bacterial biofilm, and untypical lytic protein, which suggest that further studies on its use in biotechnological and/or medical applications are desired. The genome sequence is available at GenBank (accession number: MF564201). Raw data are available from authors on request. GT performed most of the experiments on characterization of bacteriophage development and its ability to destroy bacterial biofilms, participated in data analysis and helped to draft methodology chapter. SB designed the experimental work, helped to perform some of the experiments and to analyse obtained data. BN-F participated in the planning of experiments and genomic analyses, helped in data analysis and drafting the manuscript. TG analyzed sequence of phage genome. AJ-K isolated vB_EcoS-95 phage from urban sewage sample and participated in genomic analyses. AN and AD performed a part of experimental work on phage biology. MR performed electron microscopic analyses of the phage. GW participated in analysis of the results and drafting the manuscript. AW was the principal investigator of the project, supervised the work, and participated in drafting the manuscript. This work was supported by National Science Center (Poland) (project grant no. 2015/17/B/NZ9/01724). We would like to thank the Perlan Technologies company (Poland) for providing the Tomocube holographic 3D microscope. Table S1. Bacteriophage vB_EcoM-95 genome annotations. Table S2. Mass spectrometry analysis of bacteriophage vB_EcoS-95 virion. Appleyard, R. K. (1954). Segregation of new lysogenic types during growth of a doubly lysogenic strain derived from Escherichia coli K12. Genetics 39, 440–452. Bachmann, B. J. (1972). Pedigrees of some mutant strains of Escherichia coli K-12. Bacteriol. Rev. 36, 525–557. Beutin, L., Montenegro, M. A., and Orskov, I. (1989). Close association of verotoxin (Shiga-like toxin) production with enterohemolysin production in strains of Escherichia coli. J. Clin. Microbiol. 27, 2559–2564. Casadaban, M. J., and Cohen, S. N. (1980). Analysis of gene control signals by DNA fusion and cloning in Escherichia coli. J. Mol. Biol. 138, 179–207. Grant, S. G., Jessee, J., Bloom, F. R., and Hanahan, D. (1990). Differential plasmid rescue from transgenic mouse DNAs into Escherichia coli methylation-restriction mutants. Proc. Natl. Acad. Sci. U.S.A. 87:4645–4649. Patterson, T. A., and Dean, M. (1987). Preparation of high titer lambda phage lysates. Nucleic Acids Res. 15:6298. Sambrook, J., and Russell, D. W. (2001). Molecular Cloning: A Laboratory Manual, 3rd Edn. New York, NY: Cold Spring Harbor Laboratory Press. Copyright © 2019 Topka, Bloch, Nejman-Faleńczyk, Gąsior, Jurczak-Kurek, Necel, Dydecka, Richert, Węgrzyn and Węgrzyn. This is an open-access article distributed under the terms of the Creative Commons Attribution License (CC BY). The use, distribution or reproduction in other forums is permitted, provided the original author(s) and the copyright owner(s) are credited and that the original publication in this journal is cited, in accordance with accepted academic practice. No use, distribution or reproduction is permitted which does not comply with these terms.